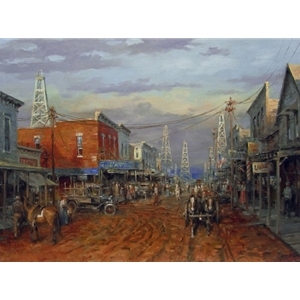 The third release in Thomas' Boom Town Series, this piece shows all the hustle and bustle of a town teeming with activity. 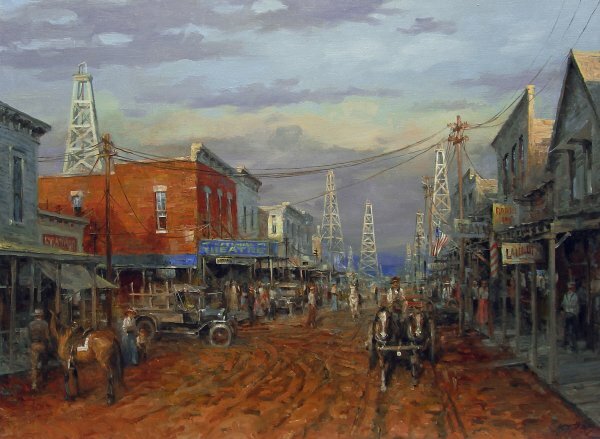 The derricks are both a back drop and an integral part of the town. Over night, literally hundreds of men seeking work on the oil rigs would invade a town. Often, with the shortage of beds, they would erect tent cities on the outskirts of a town. During the day, horses, wagons and cars would share the streets and at night, theaters and saloons would offer the needed relaxation to the men who had come for work and adventure.